Netflix Renews ‘The Killing’, Which Cannot Be Killed!! AMC’s ‘The Killing‘ just won’t stay dead. AMC cancelled the show after the second season. But due to popular demand by its audience, AMC decided to renew if for a third season, but then AMC once again cancelled the show. But never fear, Netflix now, has picked up the show for a fourth season, which stars Joel Kinnaman and Mireille Enos. You can watch the first three seasons of ‘The Killing‘ on Netflix right now. The show’s creator Veena Sud is back on board and is assembling a writing team now. While the show only garners around 1.7 million viewers live on AMC, the show is a bigger hit on Netflix, which is of course why we are getting another season, which will be six episodes. These six episodes will be the show’s last. Netflix is changing the game with their original series and reviving cancelled tv shows. Now all Netflix needs to do is revive ‘Freaks and Geeks‘ and ‘Firefly‘ with their original cast and crews, and they will be the top company in the world. 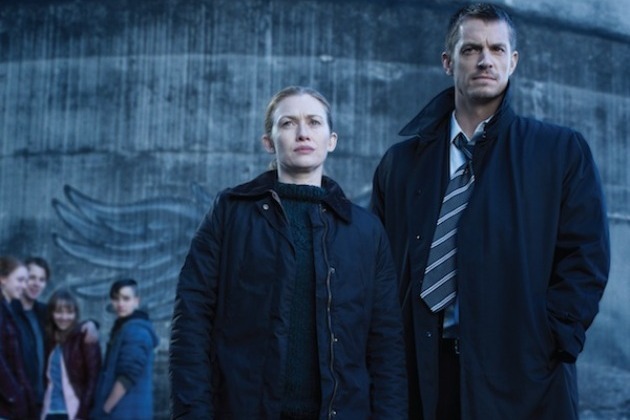 AMC’s ‘The Killing’ Cancelled After Two Seasons!!! TCA 2016 Podcast with Gwen Reyes! This entry was posted on Saturday, November 16th, 2013 at 1:14 pm	and is filed under News, Television. You can follow any responses to this entry through the RSS 2.0 feed. You can skip to the end and leave a response. Pinging is currently not allowed. « Warner Bros. Wants Javier Bardem for Blackbeard the Pirate in New ‘Pan’ Film!! Fate has me highly skilled and loaded with talent.